Art • The earthwork ''is on every art lover's bucket list,'' Salt Lake City professor says. 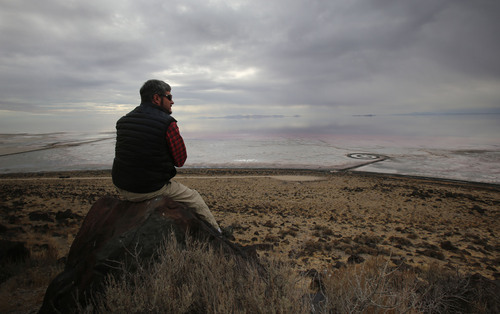 Francisco Kjolseth | The Salt Lake Tribune Salt Lake Tribune outdoors writer Brett Prettyman overlooks the Spiral Jetty from Rozel Point. 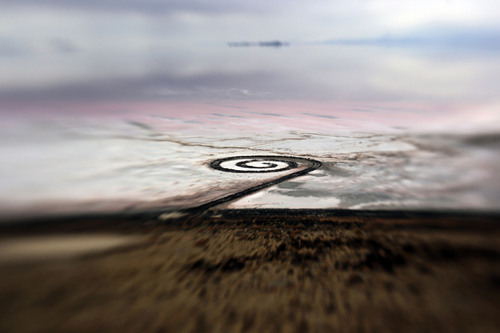 The Spiral Jetty earth works on the North edge of the Great Salt Lake created by artist Robert Smithson in 1970 is visible on Wednesday, Nov. 20, 2013. The 1,500 ft long spiral that is 15 ft wide has been below water many times since its creation in an ever changing landscape. 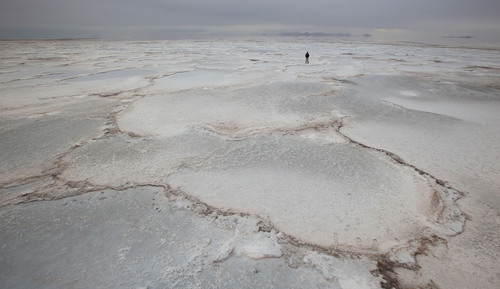 Francisco Kjolseth | The Salt Lake Tribune The landscape of the Great Salt Lake takes on the feel of a frozen ice sheet as opposed to salt as Tribune reporter Brett Prettyman takes it all in near the Spiral Jetty on Wednesday, Nov. 20, 2013. Francisco Kjolseth | The Salt Lake Tribune The Spiral Jetty earth works on the North edge of the Great Salt Lake created by artist Robert Smithson in 1970 is visible on Wednesday, Nov. 20, 2013 as seen from Rozel Point. The 1,500 ft long spiral that is 15 ft wide has been below water many times since its creation in an ever changing landscape. Francisco Kjolseth | The Salt Lake Tribune A pair of visitors walks the Spiral Jetty earth works on the North edge of the Great Salt Lake created by artist Robert Smithson in 1970 on Wednesday, Nov. 20, 2013. The 1,500 ft long spiral that is 15 ft wide has been below water many times since its creation in an ever changing landscape. Francisco Kjolseth | The Salt Lake Tribune The Spiral Jetty earth works on the North edge of the Great Salt Lake created by artist Robert Smithson in 1970 is visible on Wednesday, Nov. 20, 2013. The 1,500 ft long spiral that is 15 ft wide has been below water many times since its creation in an ever changing landscape. 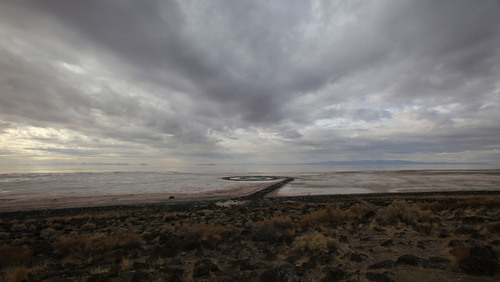 Francisco Kjolseth | The Salt Lake Tribune A train moves along the causeway that splits the Great Salt Lake as seen from Rozel Point above the Spiral Jetty earth works created by artist Robert Smithson in 1970. Francisco Kjolseth | The Salt Lake Tribune The Spiral Jetty earth works on the North edge of the Great Salt Lake created by artist Robert Smithson in 1970 is visible on Wednesday, Nov. 20, 2013. The 1,500 ft long spiral that is 15 ft wide has been below water many times since its creation in an ever changing landscape. 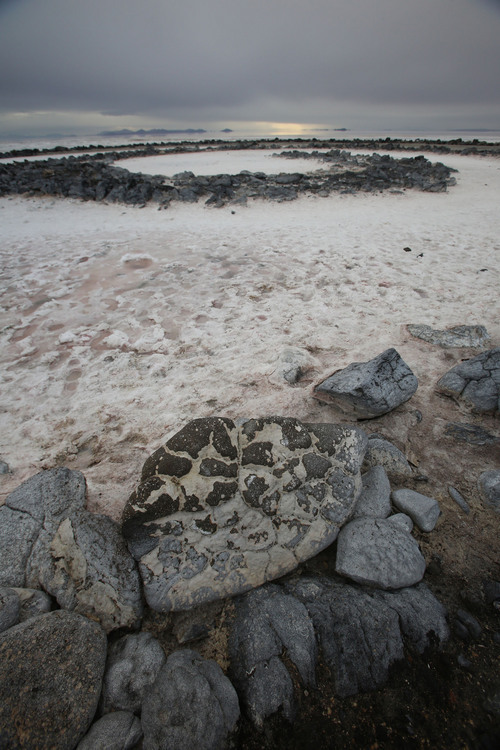 Francisco Kjolseth | The Salt Lake Tribune The Spiral Jetty earth works on the North edge of the Great Salt Lake created by artist Robert Smithson in 1970 is visible on Wednesday, Nov. 20, 2013. The 1,500 ft long spiral that is 15 ft wide has been below water many times since its creation in an ever changing landscape. 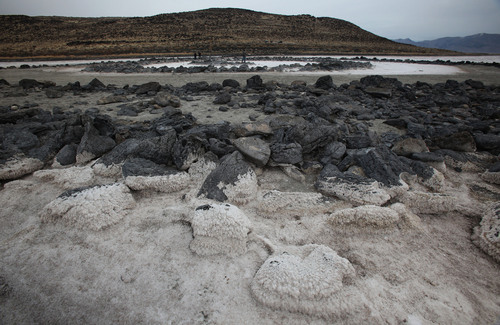 Francisco Kjolseth | The Salt Lake Tribune The Spiral Jetty earth works on the North edge of the Great Salt Lake created by artist Robert Smithson in 1970 is visible on Wednesday, Nov. 20, 2013. The 1,500 ft long spiral that is 15 ft wide has been below water many times since its creation in an ever changing landscape. 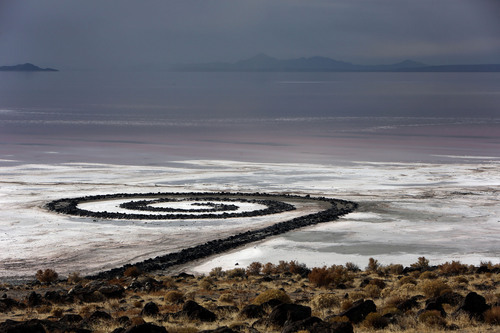 Francisco Kjolseth | The Salt Lake Tribune A small replica of the Spiral Jetty earth works on the North edge of the Great Salt Lake created by artist Robert Smithson in 1970 is visible on Wednesday, Nov. 20, 2013 from Rozel Point. The 1,500 ft long spiral that is 15 ft wide has been below water many times since its creation in an ever changing landscape. Francisco Kjolseth | The Salt Lake Tribune The Spiral Jetty earth works on the North edge of the Great Salt Lake created by artist Robert Smithson in 1970 is visible on Wednesday, Nov. 20, 2013 as seen through a unique lens with an extreme shallow depth of field. The 1,500 ft long spiral that is 15 ft wide has been below water many times since its creation in an ever changing landscape. Francisco Kjolseth | The Salt Lake Tribune The Spiral Jetty earth works on the North edge of the Great Salt Lake created by artist Robert Smithson in 1970 is visible on Wednesday, Nov. 20, 2013. The 1,500 ft long spiral that is 15 ft wide has been below water many times since its creation in an ever changing landscape. 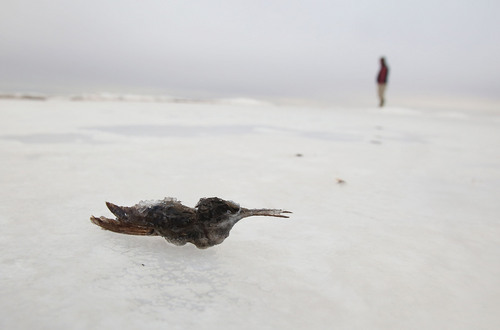 Francisco Kjolseth | The Salt Lake Tribune Frozen in time or in this case preserved by salt, a hummingbird becomes part of the landscape near the Spiral Jetty earth works on the North edge of the Great Salt Lake that was created by artist Robert Smithson in 1970 as seen on Wednesday, Nov. 20, 2013. The 1,500 ft long spiral that is 15 ft wide has been below water many times since its creation in an ever changing landscape. Francisco Kjolseth | The Salt Lake Tribune Visitors from near and far sign the log book at the Spiral Jetty earth works on the North edge of the Great Salt Lake created by artist Robert Smithson in 1970 which was visible on Wednesday, Nov. 20, 2013. The 1,500 ft long spiral that is 15 ft wide has been below water many times since its creation in an ever changing landscape. Francisco Kjolseth | The Salt Lake Tribune Getting to the Spiral Jetty is an adventure it itself with interesting things to see along the way. 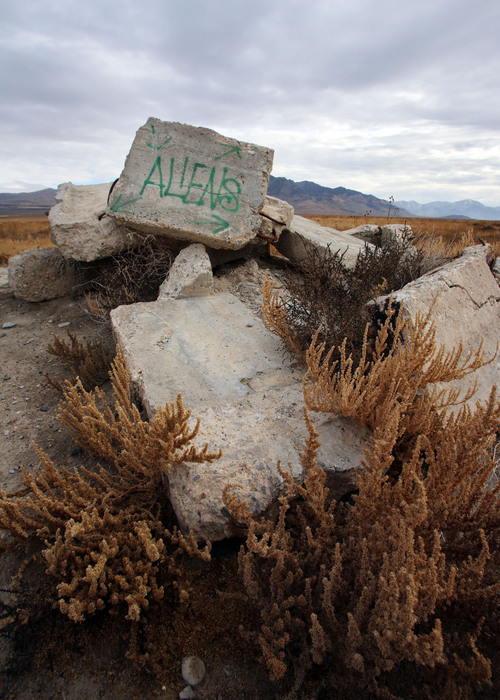 The earth works on the North edge of the Great Salt Lake was created by artist Robert Smithson in 1970 and was visible on Wednesday, Nov. 20, 2013. The 1,500 ft long spiral that is 15 ft wide has been below water many times since its creation in an ever changing landscape. 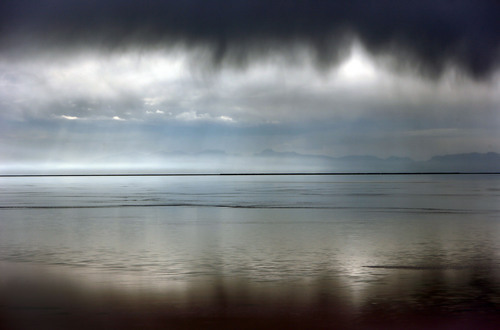 Great Salt Lake • A salt-laden November fog fills the valleys of the Promontory Mountains like the crests of waves on an ocean. Thick storm clouds allow scattered streaks of sunlight, creating sliding silver bands on a water tinted red with bacteria. Strangely segmented salt flats seem like arctic ice fields, but with the bodies of dragonflies, moths and bees littering the vast white like fallen soldiers. The stark, drastic and wide open landscape almost makes visitors to the remote shores of the Great Salt Lake forget why they have come. 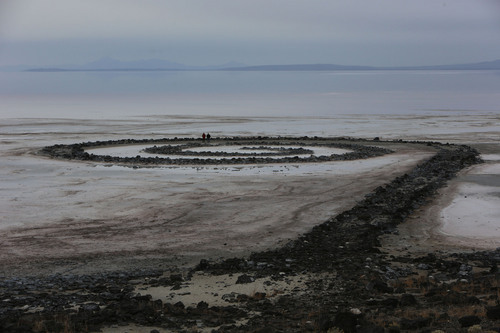 And that may well have been one of the experiences artist Robert Smithson was counting on when he created the Spiral Jetty earthwork on the bed of the Great Salt Lake in 1970. "Smithson knew what he wanted and was looking around the planet for a place that had the specific materials. 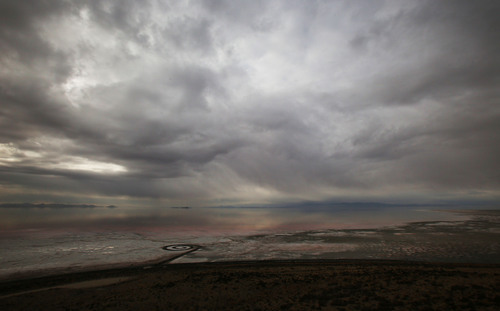 The Great Salt Lake is an inland body of saline water sometimes tainted pink, sometimes purple and sometimes red," said Hikmet Loe, an independent art historian and art history professor at Westminster College in Salt Lake City. "As a terminal lake, the water level rises and falls with evaporation or rainfall and snowpack," Loe said. "He knew about this dynamic environment and played off of it. It was his canvas." 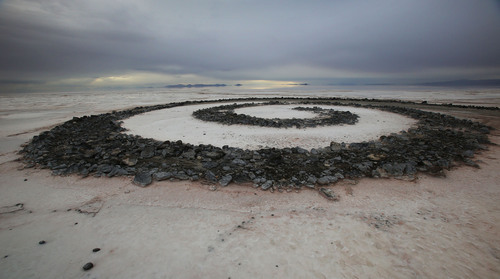 Smithson, part of a select group of artists at the time attempting to escape gallery shows and sterile museum settings, used 6,660 tons of rocks from the surrounding area to create a 1,500-foot-long and 15-foot-wide spiral formation on the sovereign lands of the Great Salt Lake bed. Unknown to many people, the original earthwork was not a spiral. Smithson had workers create a hook that ended in an island. He returned to Rozel Point in Box Elder County shortly after it was completed and had the same crew take apart the island and turn it into a spiral. "At one time people believed there was a whirlpool in Great Salt Lake that had a subterranean tunnel that spit out in the Pacific Ocean," said Loe, who is writing a book about Smithson and the Spiral Jetty. "A whirlpool is a spiral and he wanted to incorporate that into his work." Smithson, a naturalist who studied rocks, crystals and animal bones in his basement as a kid, also wanted to use a spiral because salt crystals grow in a spiral formation. The naturalist-turned-artist also wanted his work  which appears small set in its environment, but massive when people are standing on it  to incorporate organic and inorganic qualities. The red or pink tones of the lake may represent blood and are countered strikingly with the black of the rock used in the formation and the white salt. Gretchen Dietrich, executive director of the Utah Museum of Fine Arts, says interpretations, meanings and experiences of the Spiral Jetty vary based on a viewer&apos;s life circumstances at the time of the journey to see the art and change on every visit  just like the art itself. "It is profoundly amazing for me every time I have been there and I have probably been there a dozen times," Dietrich said. "It changes dramatically because of the environment. It is super beautiful, super underwhelming, super overwhelming, huge and tiny all at the same time," she said. "It is one of the most important artworks made in the world in the 20th century. People who know and care about art all over the world know about Robert Smithson&apos;s artwork here in Utah and they all want to see it. It is on every art lover&apos;s bucket list, for sure." The Utah Museum of Fine Arts  which manages the Spiral Jetty in collaboration with the Dia Art Foundation in New York and the Great Salt Lake Institute at Westminster College  also carries a collection of Smithson drawings, images and a self portrait at its location on the University of Utah campus. Due to high water  at one point the Jetty was roughly 16 feet under and not visible  Loe figures the formation has been visible for only a third of its life. That provides a sense of time in itself and almost makes the Spiral Jetty feel like a touring art collection, available only at certain locations for a limited time. The Jetty is currently completely out of the water, with some large puddles in and around the art. Take mud boots if you plan to visit. 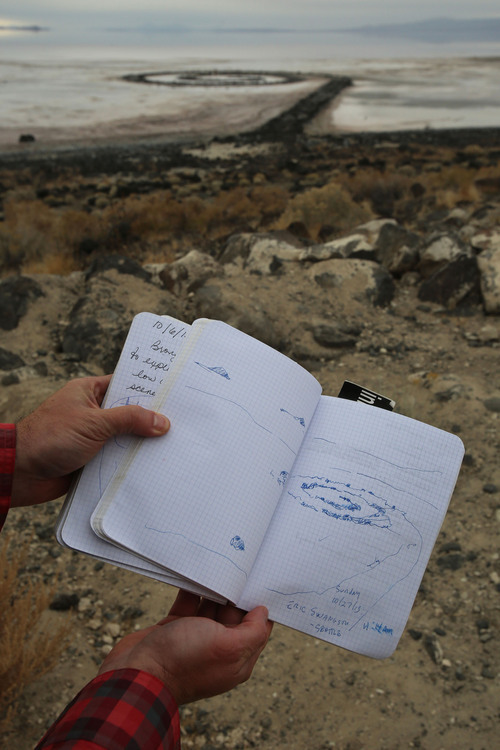 An anonymously donated notebook in a plastic bag in the parking area near the Spiral Jetty collects thoughts from visitors around the world. Many indicate they made the trip from other continents for the sole purpose of seeing the art. Some create their own art to go with their entries. People with homes closer to the earthwork sign the guest book noting special occasions such as birthdays, anniversaries and first dates. And then there was the man Loe watched during one of her trips to the Spiral Jetty. He parked his car, walked the length of the Jetty, turned around at the end of the spiral, walked back, got in his car and left. Perhaps he was just unwinding. The Salt Lake Tribune has partnered with KUED-Channel 7 for a second production of The Utah Bucket List. Stories on destinations on the list will run in the Tribune leading up to the 2014 airing of the show on KUED. Visit the Facebook page "Utah Bucket List" and follow @UtahBucketList on Twitter. Salt Lake Tribune stories and videos from the first show are available at http://www.sltrib.com and http://www.kued.org. A copy of The Utah Bucket List program on KUED is also available. The Spiral Jetty is roughly 2.5 hours from Salt Lake City and 15.5 miles southwest of Golden Spike National Historic Site in Box Elder County. The Utah Museum of Fine Arts is hosting British artist Tacita Dean on Jan. 25 at 5 p.m. as she discusses her film "JG." 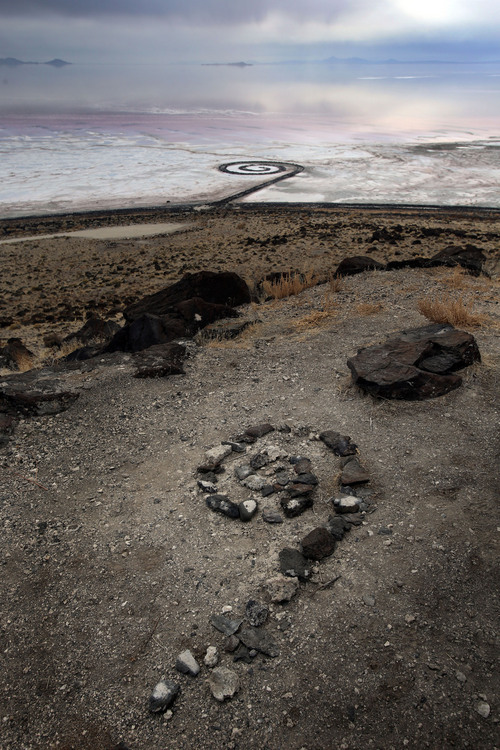 Dean saw the Spiral Jetty while serving as a fellow at a Sundance Screenwriter&apos;s Lab in 1997. Discussions with author J.G. Ballard about the Jetty led her to produce the film. In it, she explores the nature of time through the Jetty and through Ballard&apos;s short story, "The Voices of Time." "This site was a rotary that enclosed itself in an immense roundness. From that gyrating space emerged the possibility of the Spiral Jetty. No ideas, no concepts, no systems, no structures, no abstractions could hold themselves together in the actuality of that evidence. My dialectics of site and nonsite whirled into an indetermined state, where solid and liquid lost themselves in each other. It was as if the mainland oscillated with waves and pulsations, and the lake remained rock still. The shore of the lake became the edge of the sun, a boiling curve, an explosion rising into fiery prominence. Matter collapsing into the lake mirrored in the shape of a spiral. No sense wondering about classifications and categories, there were none."  "The Spiral Jetty," an essay by artist Robert Smithson in 1972, two years after he created the earthwork.